Published: Oct. 4, 2015 at 09:31 p.m. Updated: Oct. 5, 2015 at 01:33 p.m.
ORCHARD PARK, N.Y. -- The gesture seems collegiate, perhaps somewhat redundant -- and, given the team in question, even a little macabre. 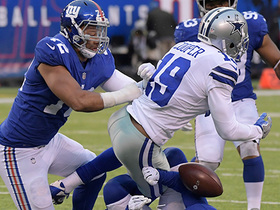 When you consider the context of the 2015 New York Giants, a team reeling from the loss of its most celebrated defensive player following a Fourth of July fireworks-related fiasco, the sight of dozens of Jason Pierre-Paul's teammates holding up a single finger before the start of Sunday's fourth quarter is downright surreal. Yet the Giants, who were in the process of rolling to a 24-10 victory over the favored Buffalo Bills at Ralph Wilson Stadium, surely weren't paying tribute to their sidelined defensive end and his missing digit. Nor were Tom Coughlin's players, who would end the day having fought their way back to .500 after a pair of season-opening defeats, suggesting that they are the NFL's preeminent outfit a quarter of the way through the regular season. "It's not, 'We're No. 1,' " Giants quarterback Eli Manning clarified as we spoke at his locker after the game. "It's a reminder to ourselves to elevate our play in the fourth quarter. So now, we all put the finger up to drive that point home." 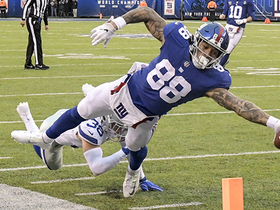 Sure enough, for the second consecutive week the Giants finished strong, responding to the Bills' lone touchdown drive -- which cut the New York lead to six with 9:41 remaining and sent 70,677 fans into a frenzy -- with a dagger of a counterattack. 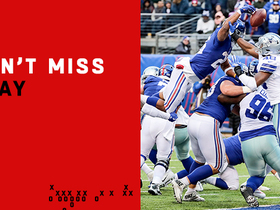 On third-and-3 from the Giants' 49, Manning caught the Bills' ultra-aggressive defense off guard, disguising a short screen to Rashad Jennings and watching the running back storm down the left sideline. 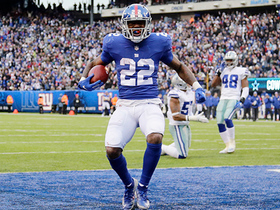 Three missed tackles later, Jennings was celebrating in the end zone, Manning (20-for-35, 212 yards) had notched his third touchdown throw of the day, and the Giants (2-2) had shaken off yet another supposed dire circumstance during the Coughlin era to get right back in the NFC East mix. "We're just getting started," Coughlin told me as he jogged off the field following his 166th regular-season victory in 20 seasons as an NFL head coach. Later, the exacting but empathic 69-year-old added, "Whatever happens, whatever people say, we just keep rolling. When people say we're down, we just keep swinging. That's what we do." Naturally, after the Giants blew late leads against the Dallas Cowboys and Atlanta Falcons to start the season 0-2, Coughlin tuned out the noise and showed up to work the following Monday with a firm message for his players: You need to step up your games, especially in the moments that matter most. "We decided, 'I owe it to my teammates to step it up in those moments,' " Giants running back Shane Vereen explained. "[Holding up the finger] symbolizes a deal we made with each other, the way we're gonna increase our level of play when the game is on the line." Added guard Geoff Schwartz: "We have to win the fourth quarters. [The finger] is just a reminder that when you're done playing, you wanna know that you gave everything you had. We need to all be unified toward finishing the game." Well, almost all of the Giants are down with the gesture, which is similar to the four-fingered Fourth Quarter Is Ours salute employed by numerous college and high school teams. "I like [the finger gesture], but I don't participate in it," admitted veteran middle linebacker Jon Beason. "Because I feel like the first play is as important as the last play -- and that every single play can be the difference in the outcome of a game, which is the way I approach it. But that's just me. At [the University of] Miami, I didn't hold up the '4' at the start of the fourth quarter, either." In fairness, it's not as though the Giants have been waiting around to pounce since Coughlin's speech: As with its 32-21 victory over Washington on Sept. 24, Big Blue asserted its might from the start on Sunday, shutting down a Bills attack that had been averaging 33.3 points over its first three games. In jumping to a 16-3 halftime lead, the Giants limited Buffalo (2-2) to two first downs, 78 total yards and a long gain of 13. A dramatic goal-line stand early in the fourth quarter -- with cornerback Dominique Rodgers-Cromartie and linebacker J.T. Thomas III stopping running back Karlos Williams cold on a fourth-and-goal-from-the-1 Tyrod Taylor pass -- undoubtedly made the head coach even more satisfied. "The significance of [the message] is that 75 percent of the games in this league are won in the fourth quarter," Coughlin said. "Not everyone realizes that, but the way you finish means everything. We're learning. We're still not there." Whether the Giants might get back to the level of sustained excellence that Coughlin desires and demands remains to be seen, but no one should discard the possibility out of hand. Though New York has missed the playoffs in each of the past three seasons, Coughlin proved during the 2007 campaign, and again four years later, that he's capable of getting a team to peak at the right time. Those Super Bowl triumphs earned Coughlin the right to fight through this rough patch without being fired, at least to this point, and he certainly seems to have retained a measure of motivational magic. Surely, there's reason to believe: The potential return of Pierre-Paul remains uncertain, but if the pass-rushing demon can come back as any semblance of his normal self, watch out. Either way, with the 2-2 Cowboys burdened by the protracted absences of their brightest offensive stars (quarterback Tony Romo and receiver Dez Bryant), and with Washington (2-2) and Philadelphia (1-3) having looked underwhelming thus far, the Giants can dare to dream of a divisional title, and perhaps more. If they fall short, it won't be because their coach is out of touch. For all of the notorious micro-managing tendencies that drew so much attention earlier in his career, Coughlin has a softer side that he has become a bit less shy about revealing to the men he coaches. Last Friday night, Coughlin's Jay Fund Foundation hosted its 11th annual Champions For Children gala at Cipriani restaurant in midtown Manhattan, as the coach continued his efforts to aid families confronting pediatric cancer in the New York/New Jersey metropolitan area. "What we see of Coach is different than what you see," Schwartz said. "He does some amazing things. And he's just so humble about it. He doesn't really make it about him in any way, but you see the happiness and the comfort and support it brings these families, and it's really moving. "I've been to four of his events, and each time we've won the game right after it. And I believe we're now 10-1 (lifetime) after Coach's event. That's pretty cool." So is being back to .500. "After those first two weeks, when I don't think very many people gave us a shot?" Schwartz asked. "Yeah, it's pretty cool to be 2-2." So what happened? Perhaps you can't quite put your finger on it, but Coughlin's players would tell you it all makes perfect sense.